My husband and I have brainstormed many times about starting up a tradition that would implement some one on one time with each of our children. This month those ideas came to life. We decided to start with our two older children. When our youngest, Cooper, is a little older, he will be rolled into rotation as well. It happens once a month, alternating which parent gets which child. We feel like this time allows us to get to know each of our children on a deeper level and give us a better chance to actually listen to what they have to say. We are hoping and praying this lays a foundation for a life long, real and valuable relationship with our sons. 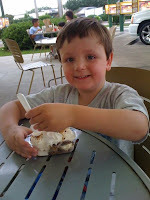 This month, I got the chance to spend time with my middle son five year old, Wesley. I called it a date night with Mommy. It was simple and so enjoyable. 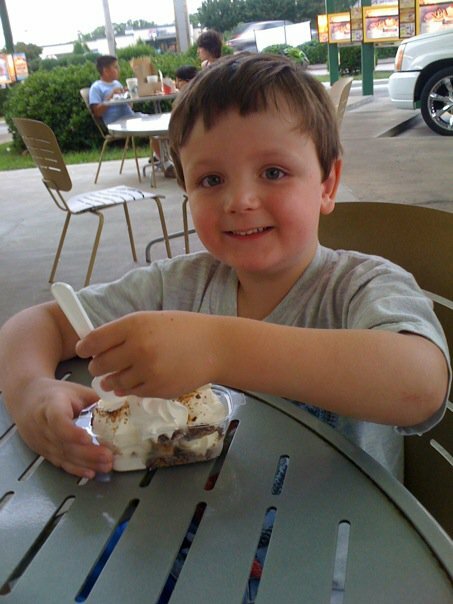 We went to Sonic where we each ordered a junior candy sundae and we split a Dr. Pepper. The total cost was $4 dollars. He smiled the whole time, which completely melted my heart, of course. The conversation consisted of The Wiggles music, what he learned in Sunday school, and his little circle of friends. We tried each others ice cream and laughed because it got all over Wes's nose. All in all, we just spent quality time together. It was truly a priceless night and I realized just how important this one on one time really is. I felt it making such and impact on me, as Wesley's mother, and how nice it was to have a conversation and a good laugh without any interruptions of day to day life. I just can't wait for all the future date nights with my sons. Next month it will be me and my eldest son, Carter, and I really truly am so excited about it. This one on one time with my sons is just filling my heart up with an unbelievable amount of LOVE.....what a great feeling it is!! !